American cars of the late '60s were full of wide expanses of metal, crisp creases, and acres of grille. But haven't you always wanted even more? And also, haven't you wanted cars that defy fundamental laws of physics? Well, get your order in for a thank-you fruit basket for artist Chris Labrooy, because he's got you covered. 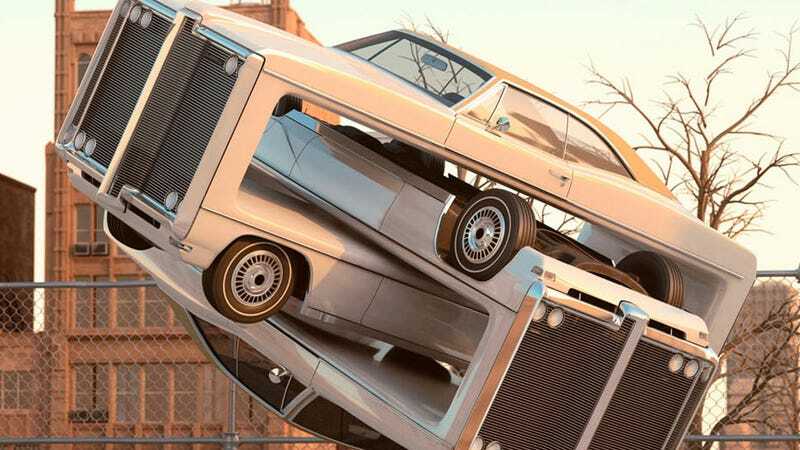 Labrooy's series is called Auto Aerobics, and as much as I hope and prayed that these were physical, metal, real-world sculptural works, they're just digital images right now. The 3D images are rendered with a very high degree of photorealism, so a little willful ignorance should be enough to convince you they're real. Real or not, they're fascinating ways to play with the look and form of these cars. I love how the forms are distorted in ways that feel more like algorithmic glitches than simple exaggeration; planes are stretched along one axis, or entire sections of details like lights or trim are repeated, volumes are opened that, while physically impossible, fit with the fundamental design language of the car. I still want to see one of these made real, though. Come on, Labooy, hire some welders and get cracking. You can find all these cars on Craigslist in an afternoon, too.